When you think of Charlottesville home automation, do you imagine lights and shades being controlled by an app or putting control of your entire home at your fingertips? The classic mistake homeowners make when considering Washington DC home automation systems is that they just don’t think “big” enough. Certainly, you can use home automation to control lights and blinds, but you can also use integrated technologies to monitor access control and surveillance, to control home theaters and multi-room audio, and even to make your house more energy-efficient. 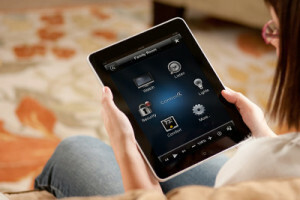 Simply put, Fredericksburg home automation can change the way you enjoy your living spaces. When multiple pieces of technology are installed and controlled in a way that’s geared toward your lifestyle, you can program your home to make a drink for you when you arrive home from work (and a different one for your spouse), to automatically open the blinds 30 minutes after your alarm goes off, or to have a television installed in your bathroom mirror automatically tune itself to your favorite news program. If you’d like to live in greater comfort, to never arrive at a dark home again, or to feel more safe and secure in your own house, then Richmond Virginia home automation systems could be the perfect answer. You are limited only by your imagination. Contact AHT today to learn more about new ideas in home automation and see how easy it is to introduce yourself and your family to digital age convenience.